With the increasing number of cafes that are being built, it is imperative that you should make your menu as creative, enticing, and versatile as possible. Whether you are just about to build one or if you are already established, you must ensure that you already know the specific food and beverages that you are going to sell in your cafe, and as soon as you already have determined them, make sure that you lay these out accordingly using the cafe menu examples and templates that we have provided in this article. Creating a cafe menu might get overwhelming especially if this is still your first attempt at making and you would have this unnecessary need to include a lot of menu items. 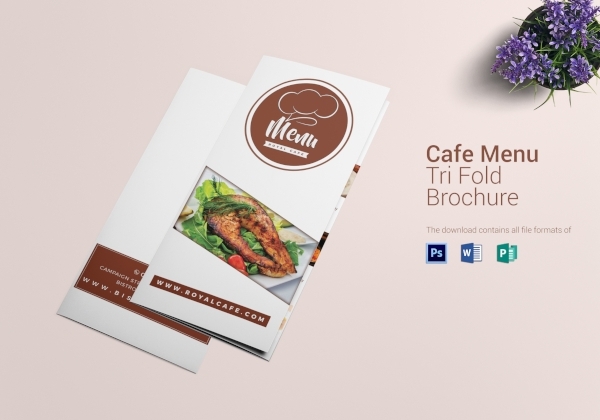 But worry no more because the cafe menu examples and templates provided in this article will give you a clear guide on how you should make your cafe menu. When deciding on the color scheme of your cafe menu, make sure that you would use colors that are appropriate for your cafe’s overall concept. 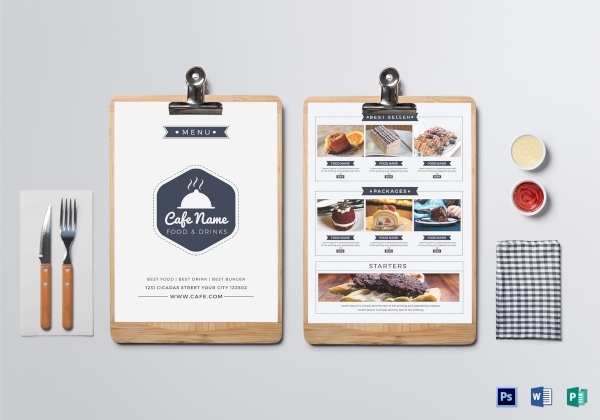 So, if you follow minimalism as your cafe’s theme, look no further because you can immediately make use of this ready-made cafe menu template provided above that will certainly help you to hasten the process of creating a cafe menu that would successfully reflect your cafe’s theme. Creating a menu may look easy at first glance but it’s actually more than simply incorporating whatever menu items you can think of. Creating a menu takes time, effort, and a lot of preparation. Your menu has the same role as that of a logo since it plays a significant part in building your brand’s awareness. 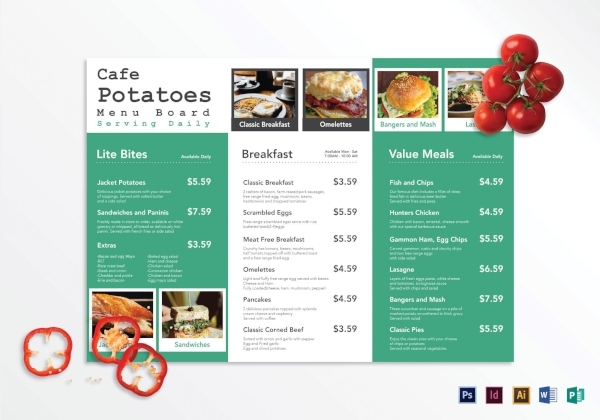 If you want to make sure that you can create an effective and successful menu layout, consider the use of this cafe menu board template. Do you have a special set of food and drinks in your cafe menu? 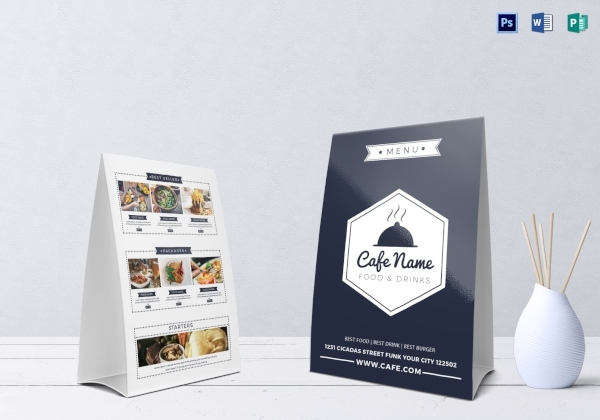 Be able to highlight this special set by making use of this cafe menu table tent template. By making use of this cafe menu, you will be able to effectively communicate with both of your new and loyal customers since you can conveniently prop this up in every single table of your cafe or in locations where your guest would most likely sit and socialize for a long time. Your cafe menu is more important than you think. It is through your cafe menu that your valued customers are provided with relevant information about the food and beverages that you serve in your cafe as well as its corresponding prices and even its detailed ingredients and descriptions. 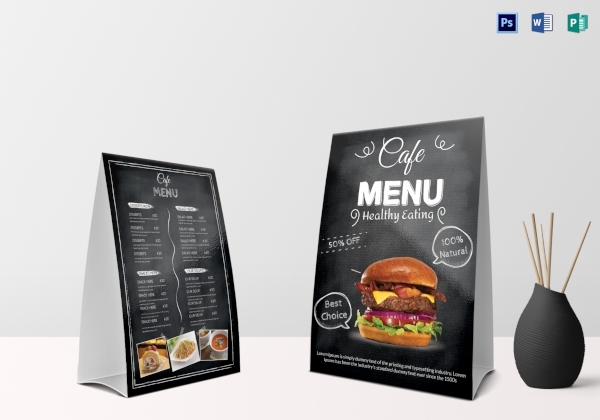 Menus, such as this classic trifold menu template provided, can also serve as the best tool that you can use in promoting your cafe’s bestselling items—only if you make sure that you place these in high visibility positions. Depending on what kind of cafe you are running, you can always make use of imagery that can help you amplify your marketing efforts, attract potential customers, and retain the current ones. The use of images does not always work for quite a number of restaurants but it may work for your cafe. If you are considering the use of food images in your menu, do not just place it carelessly; you have to make sure that it is well-placed. 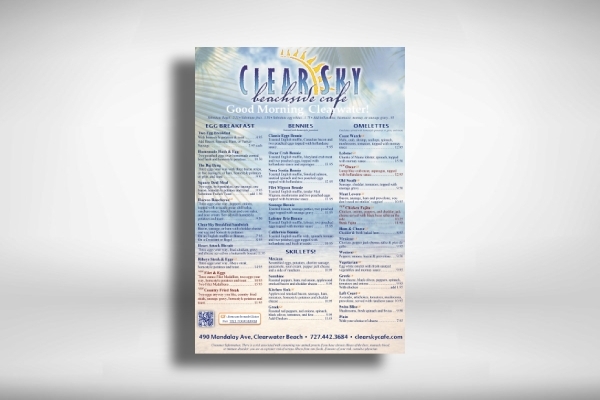 Make use of a ready-made template, such as this club cafe menu, that ensures you will have a well-curated layout for your menu items. Upon designing your cafe’s menu, always make it a point that you will be able to identify and express your cafe’s personality. Think about the possible ways that you can best represent your cafe’s image as well as its objectives. Whatever design you want your menu to have, make sure that it is effective enough in enhancing your customer’s’ impression of you and your cafe’s personality. 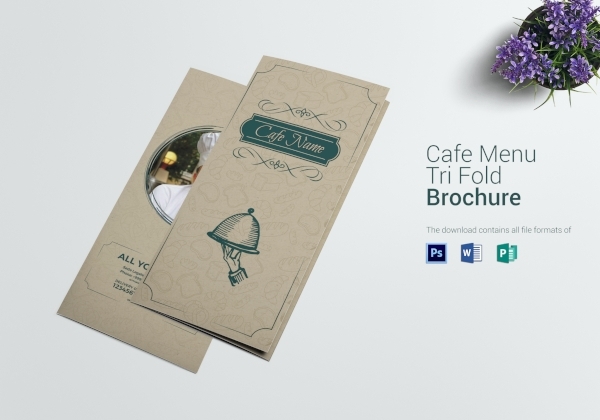 Once you can already determine your cafe’s personality, make sure to apply it using this restro cafe trifold brochure menu. If you only found out recently that your current menu creates problems rather than satisfaction to your customers, then make sure you should already take action so it would not get into a point that your customers will become apprehensive and will no longer return to your cafe. Before recreating and redesigning your menu, you have to know first what went wrong. 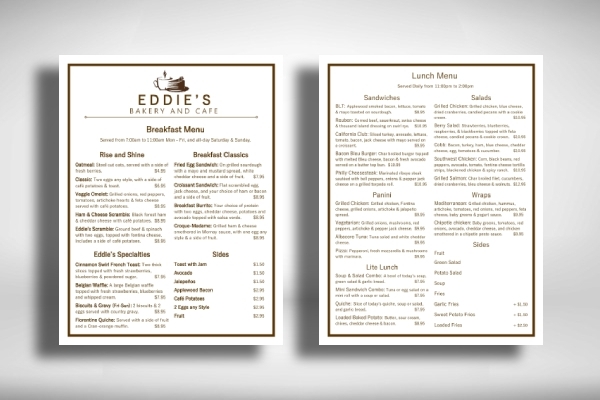 As soon as you do, make sure to download this cafe menu board template that will help you avoid the same mistakes again and turn your cafe menu into something that will finally give satisfaction to your customers. There are some establishments where they combine a bakery and a cafe and this is because of the menu items they serve to their customers. When laying out your menu items, it best if you draw a line between the two customers so that they will be able to determine what makes your business a bakery and what makes it a cafe. Take a look at the given example above that will help you determine how to design such kind of menu. Most cafes nowadays do not only serve pastries and coffee-based drinks but they would also offer breakfast meals. Serving breakfast hours is also one good way for your business to gain another avenue where you get to earn another source of revenue. Upon incorporating your breakfast menu into your cafe menu, make it a point that you will organize it the way the given example above is organized well and accordingly. Is your cafe vintage-inspired? 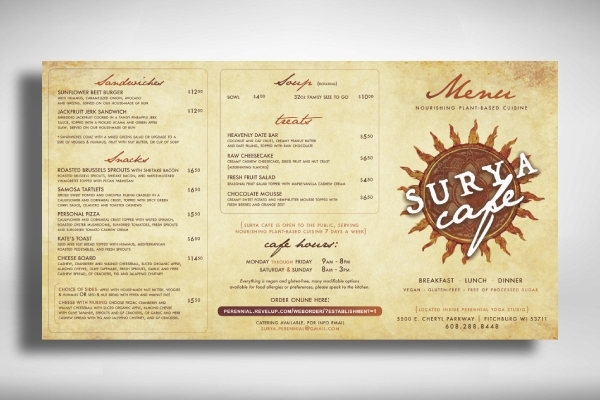 Make sure the rest of your cafe’s aspects follows through this theme by designing it the way this vintage cafe menu example is done. 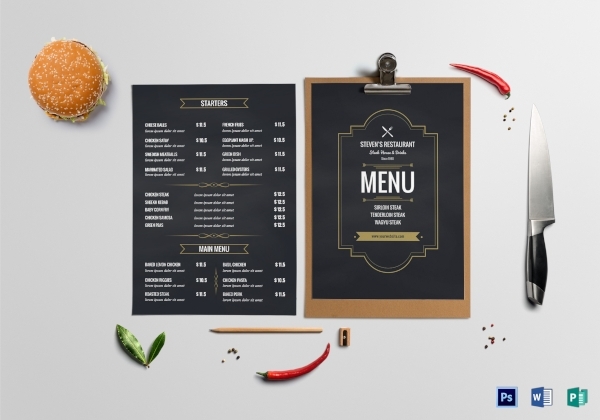 To ensure that your cafe’s theme will reflect on your menu effectively, you also have to ensure that you will be using vintage-themed design elements such as old style fonts, vintage graphic elements, and stained parchment background image.